From behind it’s the grey uniformity of the figures that’s striking. They look relaxed and comfortable on the wooden terraced seating. One or two lean in towards one another conspiratorially, but in the main though they are sharing the experience, they seem lost in their own enjoyment of whatever it is they’re watching. Working one’s way round the edge of the piece to see the the work from what we assume to be the front is a very different experience. No longer one of the crowd of watchers – and by now trapped in the corner of the room by the work – one immediately becomes not merely the watched but the laughed at. 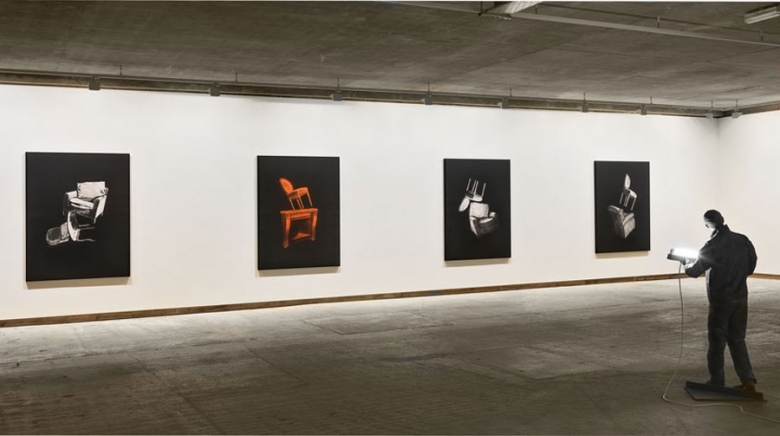 Regular readers will probably have realised by now that I like art that makes me laugh; disconcertingly, in Juan Muñoz’s Towards the Corner it is the art that is doing the laughing. And it’s laughing at me. 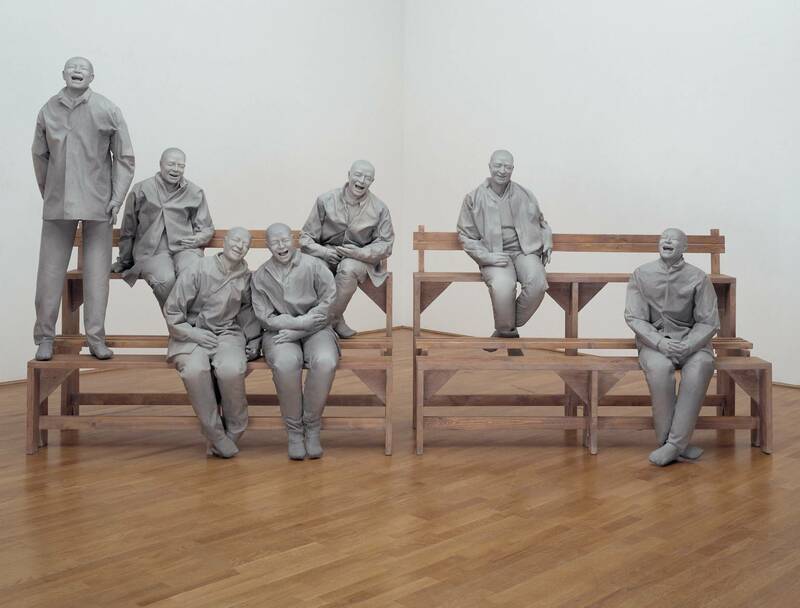 The characters who populate Towards the Corner are similar to the figures found in many of Muñoz’s installations. They are small, grey and lacking distinguishing features. The figures usually wear similar, nondescript outfits. We become part of their world without ever really finding out their story; this suggested, unfulfilled narrative makes the work all the more engaging. Muñoz told stories through his work but the lack of clarity means the audience needs to work that bit harder to figure them out. This was perhaps particularly evident in Double Bind, Muñoz’s installation in the Turbine Hall of Tate Modern in which the strange grey men inhabited a curious, half-hidden world we could only catch glimpses of built into the ceiling above us. 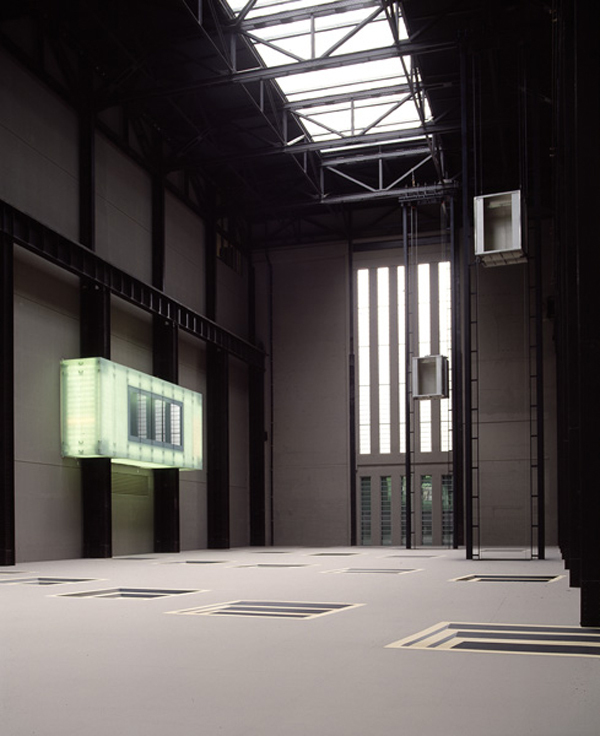 Something strange happens when you have to crane your neck to look at overhead art; though the space may be crowded – and the Turbine Hall often is – it feels like no-one else is there looking at the same work. Looking down on Double Bind from above was confusing in a different way: Muñoz created a false floor – through which two lifts that rose and fell without ever transporting anyone or anything – was disrupted by a series of apertures – some real but most optical illusions – that seemed to offer routes down into the world of the grey figures. The combination of the vast, and empty open space created by the unreachable false floor and the strange, dark space below it from which the audience could see but not access a third space was an intriguing one. The installation, still one of the most ambitious mounted in the Turbine Hall, both existed and operated on different levels creating a space which could be viewed by turns with bafflement and a certain sense of wonder. 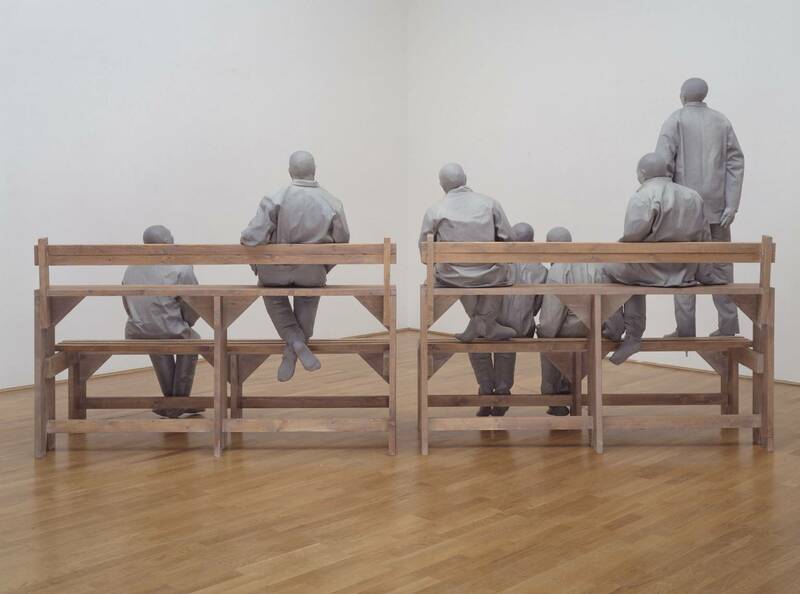 On a smaller scale – and let’s face it, pretty much all art is on a smaller scale than installations for the Turbine Hall – there’s an exhibition of Muñoz’s work at Frith Street Gallery at the moment which is what made me think about his strange grey men again now. On entering the gallery, the visitor is greeted by a decapitated figure, in a slightly deferential pose, holds his own head; smaller figures spill from its mouth. 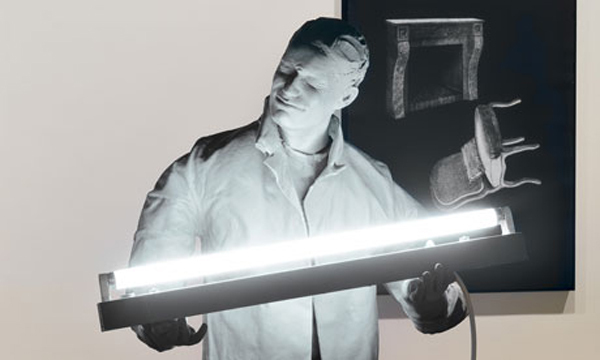 In the basement space, which somehow has a similar feel to it to the lower space of Double Bind, albeit without the darkness – think concrete in a way that’s vaguely reminiscent of an underground car-park – one of the grey men, his eyes tight shut, proffers a fluorescent tube. 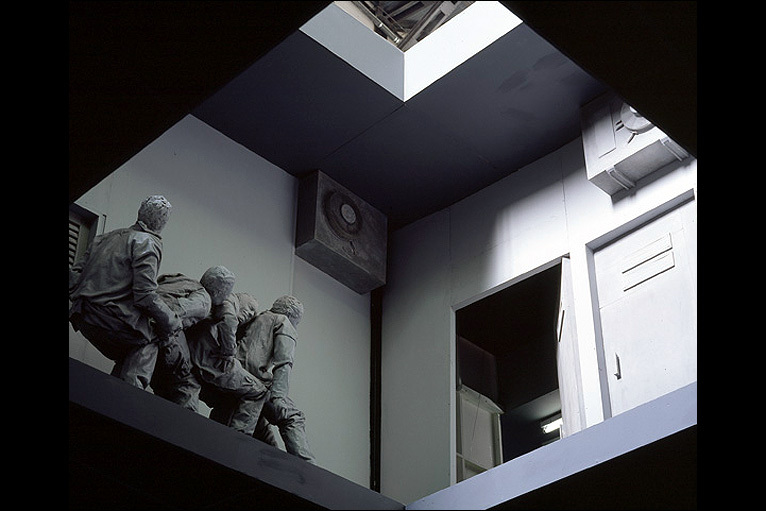 I find the individual figures less compelling than the larger works, not least because – perhaps inevitably – they don’t draw the viewer into their own space in the same way, and the central question about our relationship with architecture that seems to permeate the larger installations is absent. Though there is still a sense of theatre and a suggestion of narratives we can’t quite resolve, with the individual figures we don’t become part of the work. The show is still interesting though, not least because it includes works on paper that I wasn’t familiar with and which offer an insight into the role of drawing in Muñoz’s practice and because I enjoyed the strange interactions between items of furniture in the Mobilario series made in 1996. This entry was posted in Identity, Installation, Sculpture and tagged art, Conversation Piece, installation, Juan Munoz, sculpture, Towards the Corner by Ann Jones. Bookmark the permalink.